The legal profession, especially for those fields outside of a courtroom capacity, is enjoying a steady boom of employment and will continue to do so until 2018, according to the Bureau of Labor Statistics. It’s a growing career opportunity that lends itself well to an abundant variety of tasks and specialties. Rare is it that a paralegal complains of having too much repetition or even much downtime; they work hard and sometimes even put in long hours. Paralegals are in demand and states like Louisiana display that clearly in the sheer numbers they boast. In a 2010 Bureau of Labor Statistics survey, over 3,700 paralegals enjoyed employment in Louisiana, with a large concentration of them in New Orleans. In stride with the majority of states, there is no governing body or authority that presides over the paralegal realm, but there is a Rule 5.3 that defines a paralegal’s dos and don’ts in the workplace. A paralegal must be under the direct supervision of an attorney who is responsible for that assistant’s professional carriage and ethics, and who is charged with training the paralegal in proper conduct. As for educational requirements, there are no mandates specific to the skills or education a paralegal must possess to carry out her job. However, the Louisiana State Paralegal Association started a tradition in 1996 that provides and encourages a voluntary certification exam for paralegals in an effort to raise and uphold the standards of the profession. Those paralegals who successfully pass the exam may then be considered Louisiana Certified Paralegals or LCPs. This certification, which is voluntary, increases appeal to potential employers. As Louisiana has no set educational rules regarding paralegals, an aspiring paralegal can accept such a position when the opportunity arises and learn as they go. It is highly recommended, though, that paralegals receive formal training and education from either public or proprietary schools. This indicates to an employer that the applicant is serious, knowledgeable and competent; in return, schooled paralegals enjoy higher pay, better benefits and greater potential for advancement. Usually it is enough to undertake and pass one of the four national exams sponsored by three different associations in order for one to call herself a certified paralegal. To become a certified paralegal in Louisiana, one must complete and pass both the Louisiana State Paralegal Association’s voluntary exam, and one of four exams sponsored by one of three other national associations. If a paralegal in Louisiana has passed the state exam but not yet entered into one of the national exams, then she is required to take NALA’s CLA/CP exam, the requirements for which are above. Once both exams are undergone and successfully finished, a paralegal can then proudly call herself an LCP. However, this is no small victory. The LCP requires paralegals to complete either a paralegal program, which includes a base of 60 semester hours with a bare minimum of 15 semester hours in what is termed “substantive legal courses,” or an American Bar Association (ABA) approved program, making her certified and displaying her skill, knowledge, and training in the paralegal field. To be certificated, one must complete proprietary, private or public school courses that fulfill the requirements of the ABA (American Bar Association) or is approved by them. It’s easier to simply make sure all boxes are checked by taking courses provided by an ABA approved school. The certificate of completion is offered upon graduation of the courses or programs, can be online or on campus, day or night classes, and consist of an Associate’s degree, an Associates of Applied Sciences degree, a Bachelor’s degree, a Post-Baccalaureate degree, or specialized coursework such as might be found at a technical school. A Juris Doctorate is also acceptable. A certificated paralegal may also be a certified paralegal with the completion of the aforementioned exams. Louisiana has three ABA-approved schools, though other schools that are not ABA approved may suit your needs. Please see exam requirements. Herzing University in Kenner is a proprietary establishment offering two and four year degrees. They grant an AS, or Associate of Science, in Legal Assisting/Paralegal and a BS, or Bachelor of Science, in Legal Studies. Internship is elective. Louisiana State University in Baton Rouge offers a noncredit certificate that takes one year (or two semesters) to complete. Internship is mandatory and the course is mostly evening classes. A Bachelor’s degree in any discipline is recommended before undertaking the program, but students with 45 hours of college credit or more are eligible to be admitted. 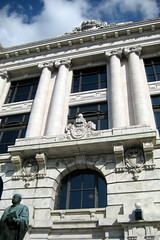 Tulane University in New Orleans is a private school that offers an Associate in Arts (AA) degree, a Bachelor of Arts (BA) degree, and a Post-Baccalaureate Certificate in paralegal studies. The AA usually takes two years to complete, the BA will take about four years, and the Post-Baccalaureate program takes one year to successfully complete as all other requirements have been finished. Internships are mandatory. It is recommended that a paralegal serious in his or her field join a local or national association. This promotes a professional attitude and shows well on a resume, aside from being helpful to the professional in terms of networking, job banking and general support. Local chapters may also offer seminars, workshops, and help keep members informed of recent developments that may affect them. Take time to look them over; some offer membership to students. (LAP-LA) Lafayette Paralegal Association, Inc.
(BRPA) Baton Rouge Paralegal Association, Inc.